President Moon Jae-in on Sunday departed for a tour of three Southeast Asian nations, continuing his push for the New Southern Policy. 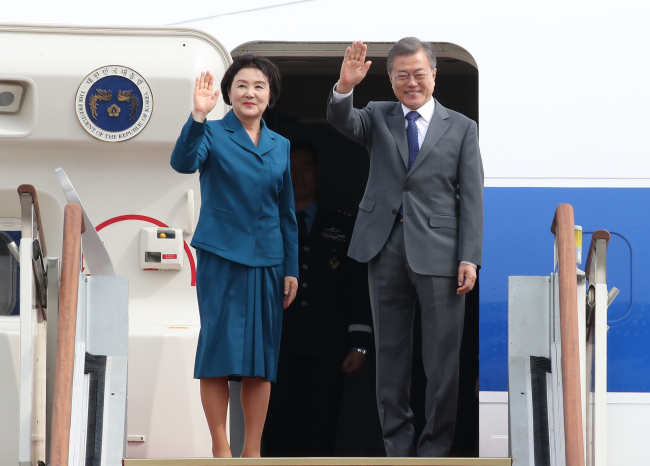 Ahead of departure, Moon emphasized the importance ties with Southeast Asian nations hold for Korea, and the potential the region holds. The New Southern Policy is one of the Moon administration’s main foreign policy objectives that follows the “3P” strategy focusing on people, peace and prosperity. Under the plans, Korea hopes to increase Korea-ASEAN trade to $200 billion and raise the number of travelers between Korea and the region to 15 million by 2020. Korea-ASEAN trade volume for the first nine months of the year came to $120 billion, up 6 percent from a year prior. The number of travelers totaled 8 million for the same period, an increase of 17 percent compared to the first three quarters of last year. Moon kicks off the tour in the Bruneian capital of Bandar Seri Begawan on Sunday. Moon is schedule to attend a welcoming ceremony hosted by Sultan Hassanal Bolkiah on Monday, and hold a summit meeting. From Tuesday, Moon will begin a three-day trip to Malaysia. Moon is scheduled to attend a Hallyu and halal exhibition organized by Korean corporations, and hold a meeting with Koreans living in Malaysia. On Wednesday, Moon will hold a summit meeting with Malaysian Prime Minister Mahathir Mohamad. The summit will be followed by signing of memorandum of understanding, and a joint press statement. According to Cheong Wa Dae, the two leaders’ discussions will focus on increasing bilateral cooperation in a wide range of areas including information communication technology and artificial intelligence. Moon will then attend a state dinner hosted by Sultan Abdullah of Pahang, the current reigning monarch of Malaysia. On Thursday Moon will attend a Korea-Malaysia business forum, before heading to Cambodia for the final leg of the trip. While in Cambodia, Moon will hold a summit meeting with Prime Minister Hun Sen, and discuss ways to increase cooperation in agriculture, infrastructure, construction and finance, among other fields.